A new USC/Los Angeles Times poll of likely voters finds Democrat Jerry Brown has opened up a 13 point lead on his GOP rival just over a week before Election Day. 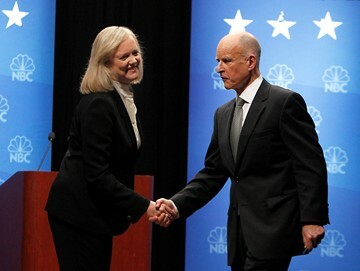 According to the poll, 52 percent of likely voters prefer Brown, compared to 39 percent for Whitman. By comparison, Brown held an 8 point lead over Whitman as recently as last week. Whitman, who has spent a record-breaking $141.5 million of her own cash on the race, has dropped in the polls largely because she's losing serious ground among Latinos, women and independents. According to the USC/LAT poll, Brown has nearly doubled his advantage among Latino voters in the last month and now leads Whitman by 34 points. He has a 21 point lead among female voters and a 37 point lead among self-described "non-partisan" voters. That's in part due to the controversy surrounding Whitman's former housekeeper, who accused the GOP candidate of knowingly employing her even though she was in the country illegally and then firing her for "political reasons." A majority of those polledâ€”52 percentâ€”said Whitman did not handle the controversy well, though, according to the Times, that judgment was far more pronounced among Latinos and women. All told, 52 percent of likely voters now hold an "unfavorable" view of Whitman, making her the only statewide candidate in California with a majority negative impression.